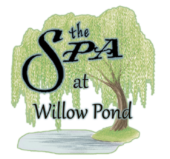 The Spa at Willow Pond gives you the feeling of elegance and relaxation at the scenic estate nestled in Sinking Spring. If you are looking for an escape and don’t want to travel far, look no further. We have been in the spa business for 15 years and pride ourselves on great customer care with unique services available. Please call us at 610-406-5733 to talk to our professional staff. They will ensure you get a personalized treatment for your mind, body, and soul.